To give you sneak preview of what we’re talking about, here’s a screen shot of the mostly-empty bracket. Only the starting 64 teams have been entered. The rest is for you to pick, or for the competition to decide! You’ll note in the upper-left corner that the 16th seed in the Midwest group hasn’t been decided, so you’ll have to update that once they’ve played their play-off game. To find out how to use this diagarm, read on! 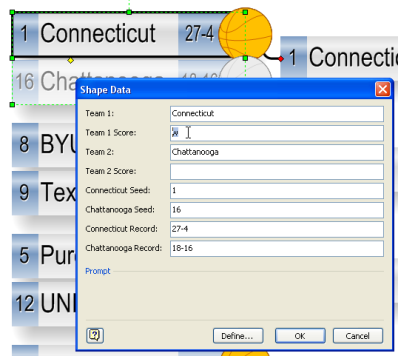 Each game has Shape Data fields behind it that store information related to the teams. There are fields for team name, seed position, season record, and a score for the actual game. You can view and set this data by double-clicking a game shape, or by using the Shape Data window (available under the View menu.) But you don’t really need to enter data other than the scores for the games, because the diagram is smart enough to pass winner-data on to the next round. There are two methods for setting the winner of each game: using actual scores, or by just selecting a winner. We figured that some people might want to track the actual results of the tournament, and others would just want to chart their picks. The dual-method for selecting winners will help you to do either one. Notice also the fields for seed and record, with the labels updated to reflect the team’s names. Since people will be using this chart to enter office pools and other illicit competitions (hah!) they might just want to quickly mark their picks, and not bother with scores. Or, even quicker, just right-click and select the winner from the context menu. Right-clicking is by far the easiest way to march through the chart and select your winners for each game. If you decide you don’t like your pick, you can always click “Undecided”, and Visio will reset the game to a neutral state. 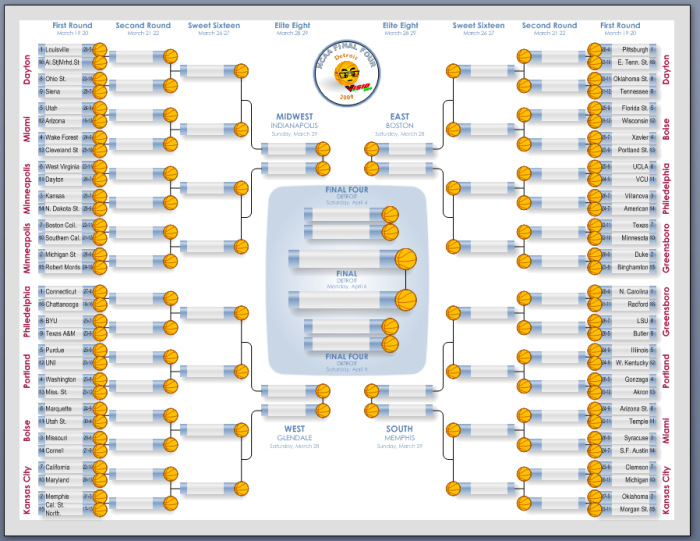 Regardless of how you set the scores, this Visio diagram uses ShapeSheet smarts to help you out! You don’t need to re-enter any data for each round of the tournament. Once a winner is specified, the next round will automatically get the data from the last round. Here we can see several rounds where the user entered actual scores. See how the losers get faded out and the winners get emphasized? In the next case, the user just went click, click, click to specify his picks. You’ll notice that there are no scores shown in the basketballs, but the losers still get grayed out, the winners get highlighted, and the data is passed to the next round. 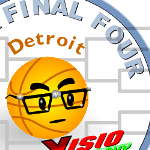 We hope you have fun with the tournament, and that our Visio bracket helps you in that pursuit. If you have any feedback you’d like to share with us, be sure to leave a comment below! I actually do have them knocking out FSU, but losing to Xavier. Love your interactive bracket! Only item I noticed is that your final 4 had the wrong combo of games with Midwest vs. East (rather than East vs. South) and West vs. South (rather than Midwest vs. West). 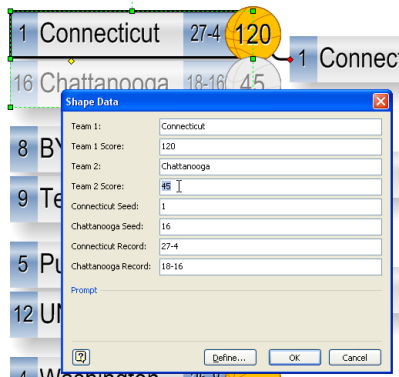 However, I was able to overwrite the teams, seeds and records to make it match up since it was editable text fields. Thanks for the sharp eyes, DC. I got it messed up when I tried to squeeze the last rounds onto the page. The link has been updated with the corrected Visio file. fantastic bracket. just curious Visio Guy if there is a “quick and easy” way to change the basketball to another graphic if someone wanted to use this for another sport?